In 2013 the KVIS decided to select one garden each year to be improved. 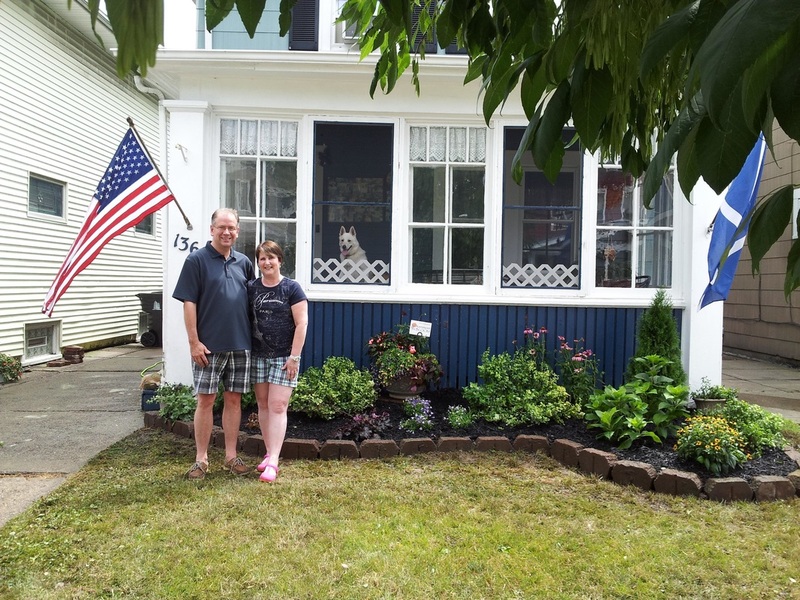 Our first Garden Makeover was the home of Audrey and Gordon Moorhead. Those attending the Bloom Breakfast that year were each given a paper with the image of the Moorhead’s home and they were asked to suggest designs for their Tremaine Avenue home front garden. These designs and others were proposed to the Moorhead’s and a final design was created utilizing some of the plant material they already had in their garden bed. The day set aside for the Garden Makeover was rainy as KVIS volunteers gathered to first remove edging stones and create and dig in the new outline of the garden. The damp volunteers (in photo above from left: Betty Graber, Pat & RIch Dowling, Melissa & Michael Foster) became quite muddy working on knees to place the edging stones, trim transplants, turn the soil, and make sure all was ready to receive the new plants. As the rain became even stronger, the plants were placed then dug in and nestled in their new home. 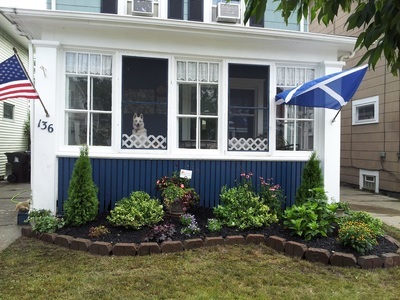 Because the home owners needed to have the garden be relatively free of a lot of care, weed barrier was placed over the soil and a thick layer of handsome dark mulch placed over it. 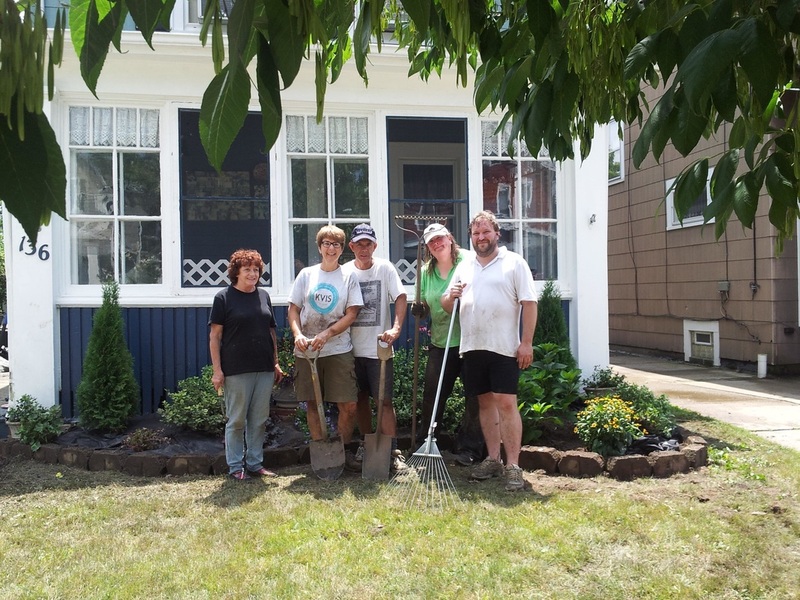 As the mulch was being placed, the rain stopped and the sun began to shine as the homeowners and volunteers stood back to appreciate the transformation. 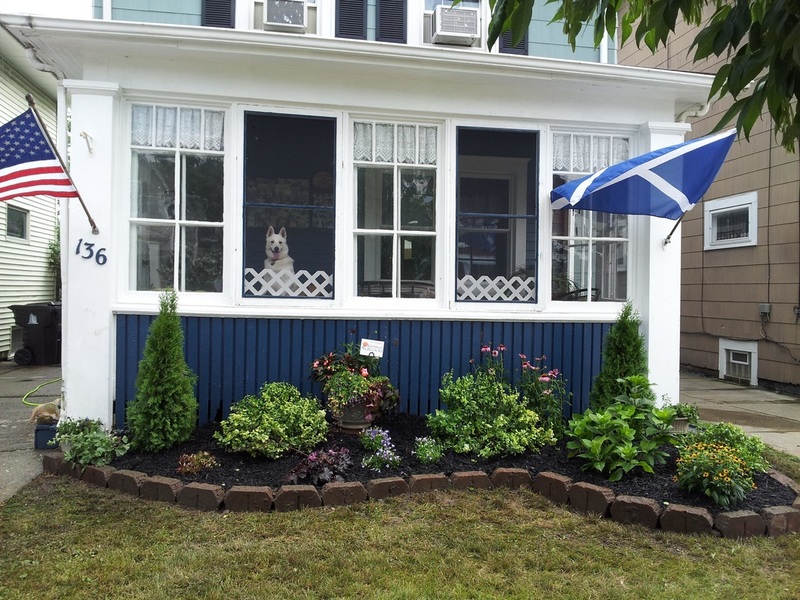 YOU Could Win a Front Garden Makeover! 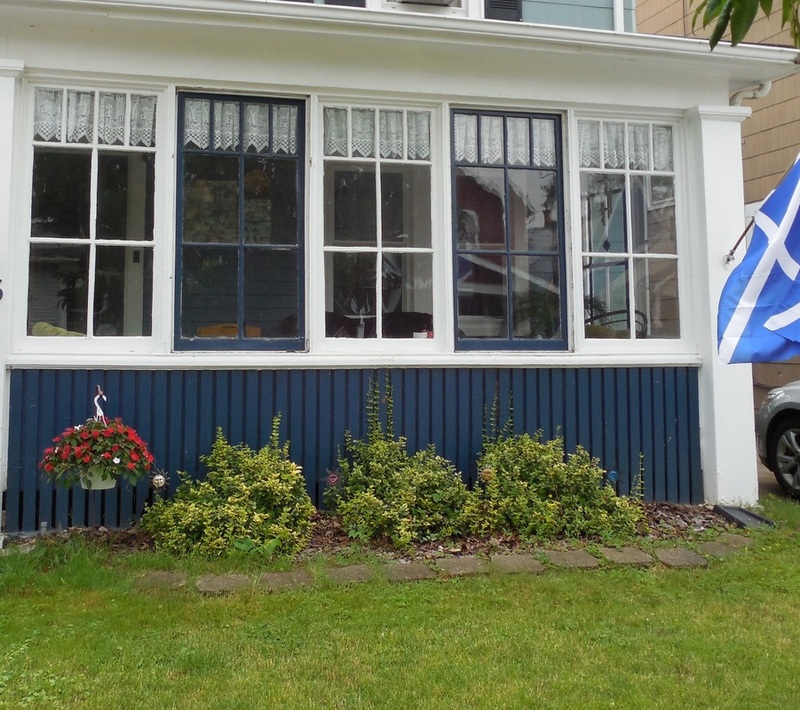 Is your front garden a bit dull, lacking color or form -it is uninspiring and a bit lacklustre? Have you been pining for a front garden that will enhance your home -making it look lovely and more valuable? 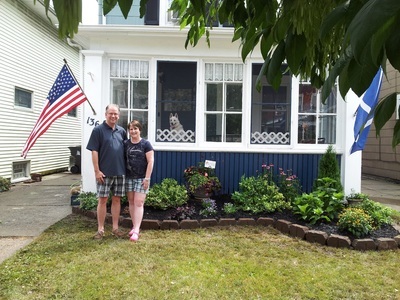 If so, then you may want to consider completing the Kenmore Garden Makeover form letting us know why you think you need a garden makeover. One Village of Kenmore address will win. Open to any type of residential dwelling; if you enter the contest for a rental property, you must check with your landlord. 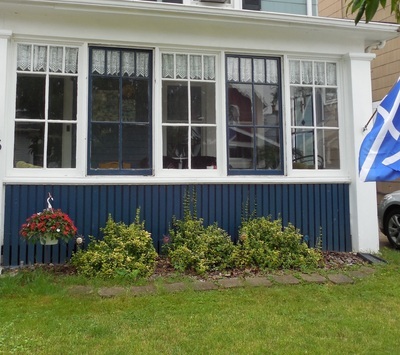 If a rental property applicant wins we will contact the landlord to confirm that the makeover is acceptable. Please apply only once. Applications must be received by June 30, 2015. The KVIS was asked by the Kenmore Town of Tonawanda Library Board to consider making over the Kenmore Branch Library located on Delaware Road. This invitation was gladly accepted and the garden transformed to include colorful perennials, flowering herbs, and mixed annuals. A small statue of a garden fairy reading a book completed the transformation that expanded the garden from a small strip in the front of the building to filling the entire space with lush growing plants. The plants used in the garden will grow to cover most of the garden with varied shape and color throughout the year. To learn a bit about the process and hours of volunteer time it took to makeover this garden, please see the pictograph found here. You can also view the original proposal here.